Grindrod Limited is a holding company listed on the JSE securities exchange with more than 100 years experience in South Africa's freight movement and related industries. Grindrod's business is all about moving cargo by road, rail, sea and air, providing integrated logistical and specialised services en route. Grindrod's head office is in Durban, South Africa and is represented by subsidiaries, joint ventures and associated companies in 43 countries worldwide employing about 7000 skilled and dedicated people. From small beginnings, the group has grown in size and stature, modernised its operations and adopted an entrepreneurial decision making approach. As a South African listed company, Grindrod views empowerment, transformation and education as an important aspect of its corporate responsibility. The Grindrod strategic objective is to achieve a key competitive advantage to become the preferred integrated freight and logistics service provider. Freight Services, Shipping and Financial Services - provide operating and marketing synergies locally and internationally. 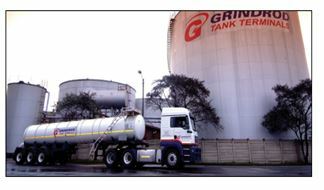 In pursuing the strategy of becoming a fully integrated freight logistics and shipping service provider, Grindrod continues to invest in assets and opportunities across the four operating divisions with specific focus on dry bulk and bulk liquid commodities, containerised cargo and vehicles. Grindrod is committed to world class maritime environmental management standards with a solid record of pollution prevention, efficient use of natural resources and generally minimizing the impact of its operations on the environment. The Grindrod group's vision is to create sustainable returns and long-term value for shareholders. Grindrod recognises its moral and legal responsibility to protect the health and safety of its employees or any person(s) affected by the operations within the group. Grindrod's health and safety objectives and targets remain simple, through full compliance with applicable legislation with a target of zero incidents, within a culture of continual improvement. A vast network of influence and strategic relationships ensures Grindrod's unmistakable high standard of excellence in freight services. A combination of highly specialist freight skills, joint ventures with prominent suppliers (including successful BEE ventures) and a wide net of services and locations translate into a leading edge for strategically positioned bulk storage and handling capacity in key ports supported by rail, road and seafreight operations. Grindrod offers individual and turnkey rail solutions in five focus areas: Rail Operations; Locomotive Engineering, Sales and Maintenance; Signalling and Train Control Systems; Railway Track Construction and Maintenance; Rolling Stock Leasing and Finance. Grindrod is a shareholder in the Maputo Port Development Company, which holds the concession to operate the port until 2043. Based in Singapore, Grindrod Shipping trades globally under two key brands - Island View Shipping and Unicorn Shipping. Shipping operates in both the dry bulk and liquid sectors of the market. A modern, low cost fleet of dry bulk vessels (handysize, supramax, and capesize bulk carriers) and products and chemical tankers are owned, chartered and operated by IVS and Unicorn Shipping respectively. The Unicorn Shipping fleet includes bunker tankers in the ports of Cape Town and Durban. IVS is focused on moving dry bulk cargo such as minerals, coal, ores and agricultural products whilst Unicorn Shipping is focused on moving liquid chemicals and clean petroleum products. The ship operating division is staffed by experienced personnel and supported by state of the art information technology systems, providing comprehensive freight solutions to customers in various sectors. Grindrod Shipping is represented globally with offices in Singapore, London, Durban, Cape Town, Richards Bay, Rotterdam, Vancouver, Tokyo and Maputo. Grindrod Bank is a competitive merchant bank, offering a personalised approach to financial services through its genuine relationships with private, corporate and institutional investors. Its operations, covering all of South Africa, are conducted out of Johannesburg, Durban, Cape Town and Pretoria. Grindrod Bank maintains a strong focus on developing its intellectual capital. Accordingly it sources extraordinary individuals, with exceptional drive and professional expertise, to create a truly dynamic niche bank. Employees are afforded the freedom to create and build on innovative thinking which in turn provides effective and efficient financial products and services for the Bank's clients. A flat hierarchical structure facilitates direct access to top management and provides the necessary agility for fast turnarounds on business decisions and deal completions. Grindrod Asset Management (GrAM) was founded in November 2009, when a number of asset management projects within Grindrod Bank were grouped together under a single asset management brand. Initially, there were two main business lines; Grindrod Private Clients (which housed the wealth management activities of GrAM) and Investment Products (which housed the unit trust and distribution capabilities of GrAM) .